The Hinderer Knives Jurassic model is an ergonomic tactical folder with lots of the same features and design inspirations of the popular XM-18 series. The blade of the Jurassic has a drop point and flat grinds for tough, heavy duty cutting tasks. 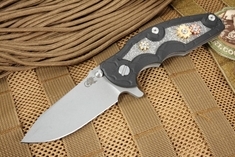 American Made Stainless CPM S35VN steel is used for the blade steel with a fine stone wash finish. The Jurassic blade has an integral flipper as well as dual thumb lugs for quick and easy opening with either hand. The handle of the Jurassic model is curved for amazing ergonomics in your hand. 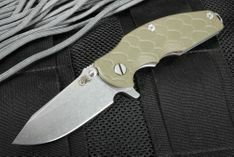 Jurassic scale pattern machined into the G-10 handle scales looks as well as it performs. Stone washed titanium handle spacer has an integral lanyard bale that makes adding your favorite lanyard quick and easy. 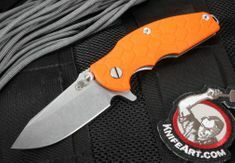 The Hinderer knives Jurassic model is made in the U.S.A. KnifeArt.com is proud to offer Hinderer Knives as a trusted, long time authorized seller.